Home » Blog » Featured » El Pahuma: one of best places to see orchids in Ecuador! El Pahuma: one of best places to see orchids in Ecuador! 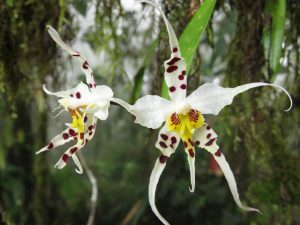 The El Pahuma Orchid Reserve was written up as one of the best places to see orchids in Ecuador, near Quito, according to a 2017 article by CultureTrip. This lush cloud forest, owned by the Lima family, is Ceiba’s first conservation project. Protected by a conservation easement signed in September 2000. The orchids here aren’t in “captivity”, rather you can see them growing wild in their native habitat by hiking around on the reserves many kilometers of trails. There are waterfalls and a restaurant too! Plan your visit!